Bayern Munich failed to win for only the third time in 20 Bundesliga games this season but their draw with Bayer Leverkusen keeps them eight points above second-placed Borussia Dortmund. Pep Guardiola brought Thomas Muller off the bench but he missed two great chances when unmarked inside the box. Julian Brandt had a chance to win it for Leverkusen but fired wide. Bayern ended with 10 men after midfielder Xabi Alonso was sent off in the 84th minute for two bookings. The visitors had only one fit centre-back, with midfielder Joshua Kimmich having to play at the back, but it was a game in which defences were on top. 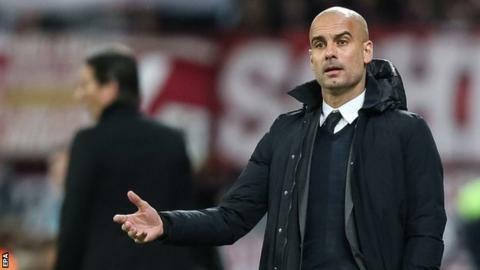 Guardiola's side missed the chance to go 10 points above Dortmund, who drew 0-0 at third-placed Hertha Berlin earlier in the day - a game watched by potential Manchester United boss Jose Mourinho. Match ends, Bayer 04 Leverkusen 0, FC Bayern München 0. Second Half ends, Bayer 04 Leverkusen 0, FC Bayern München 0. Attempt missed. Sebastian Rode (FC Bayern München) right footed shot from outside the box is close, but misses to the right. Substitution, Bayer 04 Leverkusen. Admir Mehmedi replaces Karim Bellarabi. Substitution, FC Bayern München. Sebastian Rode replaces Kingsley Coman. Attempt missed. Julian Brandt (Bayer 04 Leverkusen) right footed shot from the right side of the box is close, but misses to the left. Assisted by Javier Hernández with a headed pass. Corner, Bayer 04 Leverkusen. Conceded by Holger Badstuber. Second yellow card to Xabi Alonso (FC Bayern München) for a bad foul. Javier Hernández (Bayer 04 Leverkusen) wins a free kick in the attacking half. Attempt saved. Holger Badstuber (FC Bayern München) header from the centre of the box is saved in the top centre of the goal. Assisted by Philipp Lahm with a cross. Corner, FC Bayern München. Conceded by Ömer Toprak. Xabi Alonso (FC Bayern München) is shown the yellow card for a bad foul. Julian Brandt (Bayer 04 Leverkusen) wins a free kick on the right wing. Corner, FC Bayern München. Conceded by Roberto Hilbert. Substitution, Bayer 04 Leverkusen. Julian Brandt replaces Stefan Kießling. Attempt blocked. Thomas Müller (FC Bayern München) right footed shot from the centre of the box is blocked. Assisted by David Alaba. Attempt missed. Thomas Müller (FC Bayern München) left footed shot from the centre of the box is close, but misses to the left. Assisted by Douglas Costa. Attempt missed. Thomas Müller (FC Bayern München) left footed shot from the centre of the box is just a bit too high. Assisted by Kingsley Coman. Attempt saved. Hakan Calhanoglu (Bayer 04 Leverkusen) right footed shot from the left side of the box is saved in the centre of the goal. Assisted by Christoph Kramer. Attempt blocked. Christoph Kramer (Bayer 04 Leverkusen) left footed shot from the right side of the box is blocked. Assisted by Karim Bellarabi. Hakan Calhanoglu (Bayer 04 Leverkusen) wins a free kick in the attacking half. Substitution, FC Bayern München. Thomas Müller replaces Arjen Robben. Delay in match Wendell (Bayer 04 Leverkusen) because of an injury.